Our e-library continues to grow. Your library card now gives you access to Morningstar, for investment research, and NewsBank, which includes full text articles from local newspapers, such as the Intelligencer, Courier Times, Inquirer, and Morning Call. Morningstar: stock market analysis; equity, mutual fund, and ETF research, ratings, and picks; portfolio tools; and option, hedge fund, IRA, 401k, and 529 plan research. 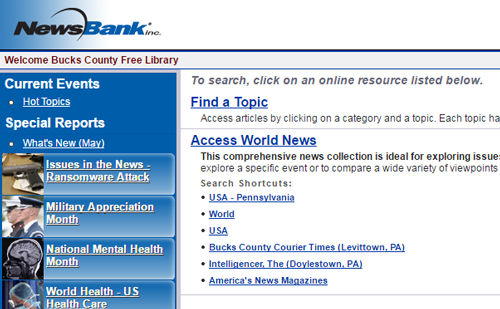 NewsBank: news database providing access to archives of media publications. Read full text articles, and explore issues and events at the local, regional, national, and international level. These resources are made possible through the support of the Hamilton G. Disbrow Trust.